Yesterday on my menu plan, Blaze Danielle asked me how my kitchen was decorated and what color it is, since I love to cook so much. So, I thought I'd share a bit about my kitchen. 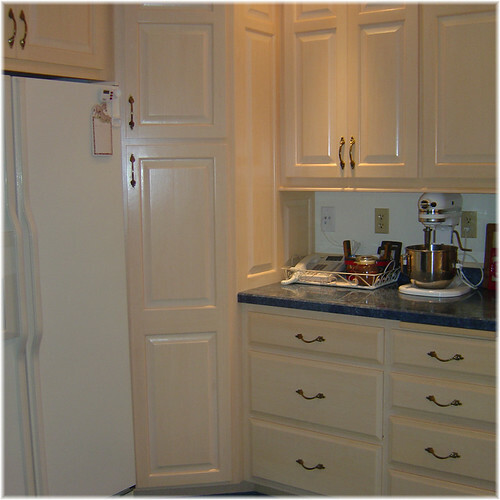 I do have a kitchen post on Kitchen Comforts as well. However, I don't dwell on the decorating aspect of it there. 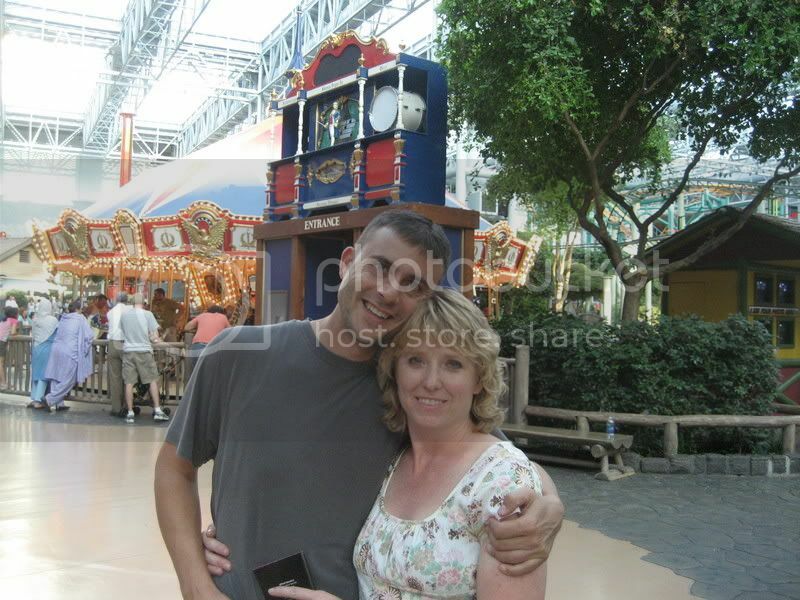 We bought this house even though there are a lot of things that we want to change. Our thought was that the house would work well until we got around to the remodeling. There is a LOT of blue in this house, I'm slowly replacing the blue floral wallpapers with paint. The last thing we'll do is replace the blue carpeting throughout the main level with wide plank hardwood flooring. The blue carpet and countertop were both there when I moved in and will be replaced eventually. In the meantime, I've accessorized in the dinette to coordinate. I love the light cream paint on the walls, it warms it up a touch while keeping it light and airy in the main living area. 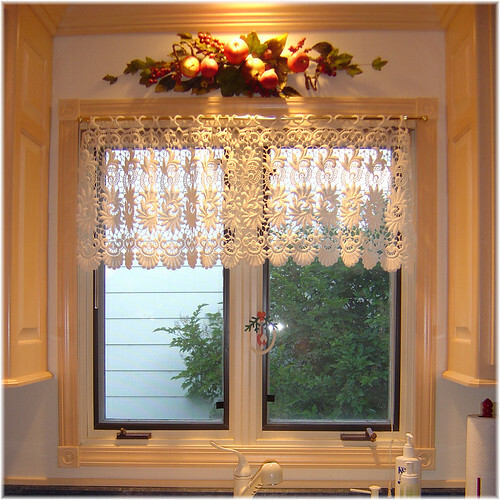 I have scandinavian lace curtains hanging above the window in the kitchen and dinette to let as much light in as possible. There are blinds, but they are always up. The kitchen itself is blue and cream, so I chose red as my accent color. 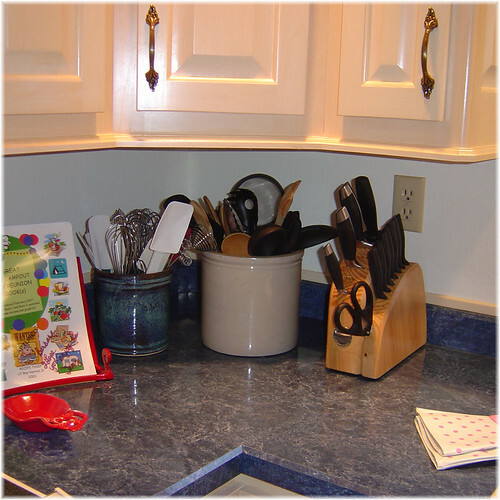 I use 3 crocks in the kitchen, two to hold my utensils and I have 1 as a cookie crock. I painted the wood lid on the cookie crock red to match the rest of the kitchen accessories. I have a tine to corral things like vitamins and medications, and I keep the phone, phone book, pad of paper and pen on a tray so when cleaning I can quickly move it out of the way and put it back. My KitchenAid mixer is a workhorse in my kitchen so I leave it out all the time. 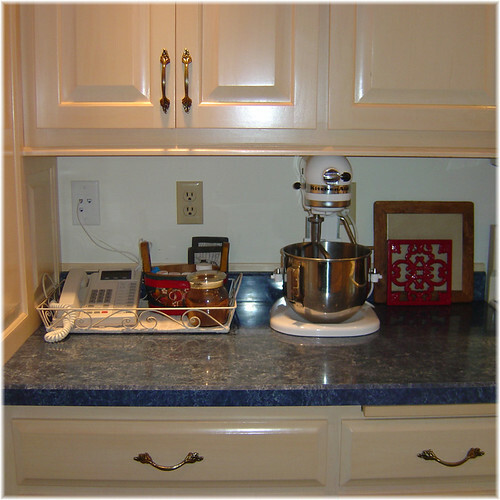 Many decluttering sites tell you to put appliances away and pull them out only when used. This makes sense if you a) have a lot of extra storage and b) use these appliances infrequently. I leave my mixer and bread machine out, they get used often. I do have a food processor, but I use a mandoline for most meals for just hubby and I, so that is stowed. Do what works for you! One thing that I do leave out that is used very infrequently is my coffee maker. It's too tall to stash anywhere, but it will be finding a home in the closet off of the kitchen when we convert half of it into a pantry. I took the photos below Monday night, you can click on any of them to be taken to my photo album on Flickr for bigger photos and notes. You have a very lovely kitchen. I love how you write too. It really brings the photos alive. I would never have guessed there was blue carpet in your kitchen and I was thinking the countertops were dark grey or black...very modern. 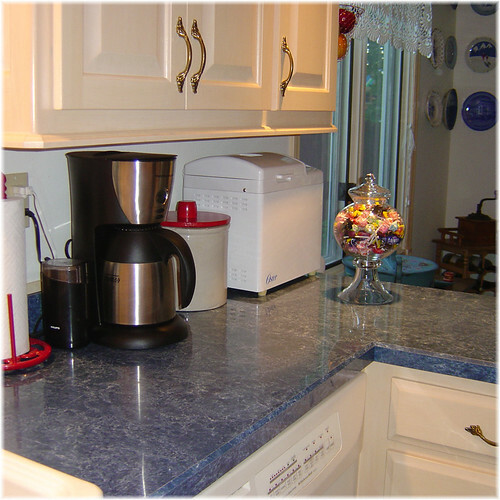 My mother n law had blue countertops in her last kitchen remodel just a short while back. You've done a great job of decorating. Want to do mine? :) We too want to replace our current floor with real wood planks. Thank you Sandra. I do love it. 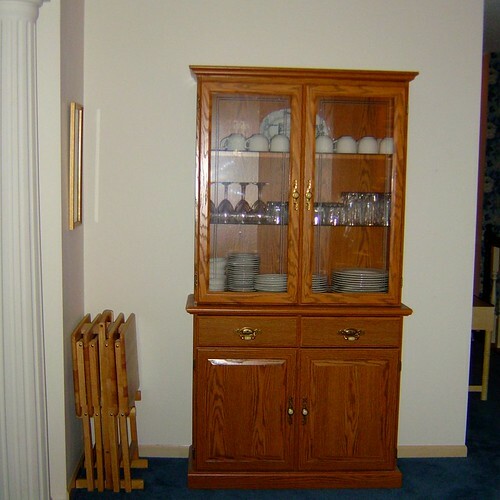 The kitchen, dinette, family room area is why I wanted the house when we were looking. I LOVE your kitchen! Well, maybe not the blue carpet, but I can totally look past that :) Everything else is so pretty! Kim: I have a hard time looking past it... I know it's temporary, so I try not to let it bug me. What a great post!! :) Thanks for sharing with us! I feel as if I just came from visiting you! :) Perhaps we had some tea and crumpets?? I love your kitchen. Someday, we will have a house with a pretty kitchen like that too. I miss a big happy kitchen but as you said, you have to look past some things sometimes. I settled for this kitchen as the rest of the house was so perfect for us (and the back yard is huge!). If we end up staying here, my hope is to completely remodel the kitchen, eating area and formal living room to make it one big room. Hubby's eyes rolled back in his head (probably looking at dollar signs, lol). But I have it all sketched out. If we ever really do that, I am SO calling on you to help me decorate! Blaze: I've never made crumpets, but I'd sure give it a whirl if you were coming for a visit. :) I have the tea covered though! Kiy: Thank you so much for the compliment! And seriously, I so agree if you are going to dream, dream big! Dreaming is fun and best of all... it's free! Hey, we need to get together to cook sometime. As many times as we have gotten together to eat, it would be fun to plan a dinner and go start-to-finish! I must say, your kitchen/dining/family room are so awesome for entertaining. :) Even if everything is soooo blue. :) Which we have discussed!! Later gator! I'm afraid I can't help you too much. These used to hang in my Amma's kitchen in Iceland. No doubt bought there sometime in the 40's-60's or made by a friend or relative of hers. There are no tags on them, so I have no idea, my Amma sews and knits but doesn't tat or crochet to my knowledge.